I’m blown away by Horizon Zero Dawn’s breathtaking landscapes, dinosaur-mecha battles, and its emotionally powerful story. In my closing article for today’s run as guest editor, I thought I’d get into why I’m loving my time with Horizon Zero Dawn and how I almost skipped over one of the most surprisingly touching moments in the game. 2017 felt like a banner year for open world games. Everything from The Legend of Zelda: Breath of the Wild to Xenoblade Chronicles 2, Assassin’s Creed Origins, and Super Mario Odyssey were incredibly long and immersive games. The years before that introduced Witcher 3, Fallout 4, and another one of my favorites, Xenoblade Chronicles X. Horizon Zero Dawn is among the best and a big part of that lies in the way the game begins. I really like it when games show the early years of a character. One of my favorite examples of that is Dragon Quest V where you start off as a young kid following your father on his adventures. Things go awry, but DQV’s arc from birth to coming of age has always stayed with me. I got the same giddy flutters playing Horizon Zero Dawn. The opening focuses on the relationship between Aloy and Rost. 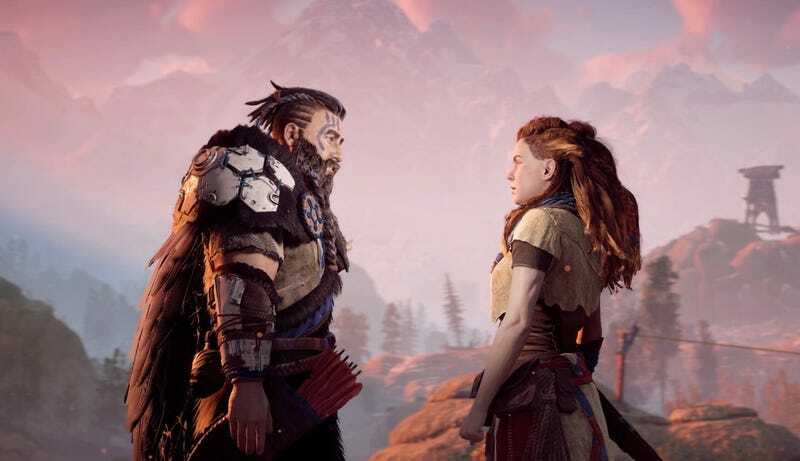 Along the way, the greater mysteries of the world are hinted at, but because it’s anchored on the father-daughter bond (even if Rost isn’t Aloy’s actual biological father), the stakes are much higher. I really cared about what happened to both characters. I appreciated all the details the game sprinkles in, like their names being Aloy and Rost, hinting at their personalities through the metallic characteristics; alloy is a mix of metals, indicating that Aloy will be a character comprised of many differing elements; Rost is like rusted metal, having suffered numerous tragedies and becoming rusty as an outcast from the Nora Tribe. At the same time, the unusual nature of their names also suggests that science and technology have been forgotten to the point where facts we take for granted have turned into folklore. “Rust,” at least as far as I know, isn’t exactly a popular name for a son. The Naming Ritual does an effective job setting up the conflict with the Matriarchs, but also shows how Rost, the traditionalist, is willing to break with tribal law to do what he feels is best for the baby put in his care. We watch Aloy from birth and in the training sequences, we learn not just about her skills, but her personality. She’s clever, tough, a little bit defiant, and always learning. Rost’s relationship with Aloy also evolves with each experience. He is very cautious about the forbidden ruins, and when she wanders in and discovers the ancient technology of the Focus, he demands she give the item to him. I could tell it was primarily out of concern and fear for her safety. She refuses despite multiple requests. But rather than snap or get upset, Rost respects her enough to let her have her way, trusting that she knows what she’s doing (even though she’s six years old at this point). The very next morning, Aloy is testing out her new gadget the same way I used to play any new gaming consoles I’d just gotten. When one of the Nora children, Teb, gets hurt, she runs to the rescue. Rost objects, but she disobeys and goes after Teb anyways (though she does look back in momentary guilt). Aloy learns more about the use of the Focus and her own abilities as she carefully rescues him. I also appreciated the way Rost changed from a state of disapproval to support based on the circumstances, knowing what she was doing was the right thing, even if it broke the Nora Tribe rules. He’s learning about her, guiding her to find herself, rather than acting as a restrictive guardian imposing random rules. It was wonderful directly witnessing her growth as a warrior and actively being part in her first kill and her first stealth mission. When Aloy expresses her desire to know more about her past, Rost is, again, supportive, informing her that the best way to gain her wish is to win the “Proving.” She spends twelve years preparing for the ritual and the training montage is inspiring because we know how much she’s sacrificed for this. When she takes down a deadly Sawtooth by herself and Rost proudly sees how powerful she’s become, I was moved by the ensuing conversation. 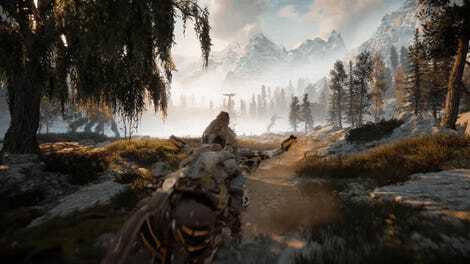 At the same time, Rost is aware that once Aloy goes through the Proving, she’ll no longer be outcast, meaning they can’t speak with each other anymore. Aloy comes up with a plan to get around this, but when they part, Rost insists they must abide by the laws. It’s upsetting, but I figured it’d lead to some comedic moments later in the game when she’d tried to see him and he’d stubbornly insist on the old ways. Aloy wins the Proving, but the entire group of contestants is ambushed by a strange cult wielding guns. Everyone around her is brutally murdered. Right when she’s about to be executed, Rost tries to defend her. When I saw him rush to her aid, I thought to myself, please don’t let him die, please don’t let him die. He’s killed in the process and she barely escapes with her life. The Hero’s Journey often begins with the death of someone dear to the main character, impelling the character into “Crossing the First Threshold” as Joseph Campbell puts it (think Luke Skywalker). The adventure had become the thing of legend. But the most moving sequence for me wasn’t part of any of the quests. Rather a quiet moment that could easily be overlooked or missed. Once I’d gotten access to fast travel via campfires, I started traveling back to all my old haunts. I wanted to see what, if anything, had changed since I’d set out. By accident, I traveled back to Rost and Aloy’s old home. I suddenly recalled one of the Matriarch’s mentioning they’d buried Rost’s remains nearby. I wandered about and found Rost’s grave outside the gates. I was surprised when Aloy starts talking at the grave as though Rost were there. She expresses gratitude to him that he came to the Proving to watch how she did, despite their cold parting. She updates him on everything that’s happened so far, including the fact that she (and me) let Olin live. As she does, there are times she pauses in sorrow and has a hard time finishing her sentence as she reflects on what happened to Rost. The camera is placed behind her, so we don’t get to see her face, but this is even more effective because we feel her anger and her pain just from the tone of her voice, sensing how much she misses him. Even though it’s a one-way conversation,it nearly had me tearing up. Their relationship felt so real and her emotion, tragically palpable. It also served as a reminder of how much had changed since her childhood and how everything they thought they knew about the world was just a glimmer of the actual truth. What surprised me was that, again, this isn’t a forced part of the game or even a side mission. This is totally voluntary, giving players more insight into her thoughts than almost any other exchange. There’s no reward in terms of skill points or experience. But instead, we get a sense of how Aloy really views the situation as she reflects on all she’s learned and the choices she (and we as the gamers) have made, tying her past together with her future. I’ve seen two dawns in the real world so far as I’ve been playing Horizon Zero Dawn all night. I’m sure there will be many more as I explore its massive world. The new environments are spectacular and the technological monstrosities I’ve battled have been amazing. I can’t wait to discover some more so I can make my way back to Rost and give him another full update. Thanks again Kotaku for the chance to be the guest editor today!